Yep this latest bit of awful news is actually truly awful. I may have been rolling my eyes a bit about the complaints about the game itself but accidently releasing player's personal information to the public is just an absolutely colossal screw up. Script kiddies with Cheat Engine or FPS exploits wasn't the issue here, it was Bethesda's own incompetence with doxing their own customers. You didn't call anything. You said it was "le ebin hackzors", not Bethesda doxing their own customers. Then there were the two (three, maybe? I wasn't paying that much attention at the time) occasions when the Playstation Network was exposed. Don't recall anyone bashing on PS4 games because of it, but again I wasn't paying that much attention. Don't recall anyone bashing on PS4 games because of it, but again I wasn't paying that much attention. I never finished Daggerfall for all the bugs and crashes to desktop DOS prompt, so I guess I’ve been on trend since 1996. And yet, there's all the people who did finish it. Whatever will we do about them and their differing experiences. The PSN wasn't "exposed" in the same way Bethesda's support system was in this latest fiasco. Hackers were dedicated enough to find a way to break security measures in place. The people who hacked PSN had to use unconventional methods to find a vulnerability in their servers. There has never been an instance where a PSN user raising a support ticket was able to view another user's ticket's information that not only contained the nature of their complaint, but also their name, home address and credit card info, because that's what exactly happened with Bethesda's support system. This isn't a case of hackers with malicious intent to steal private information from Bethesda's servers, anyone could do it by simply using the support system as intended. I can understand overlooking game bugs if you're enjoying the game and that leading to you thinking the developer is great and all, but draw the line somewhere and hold them accountable when they **** up badly like this. I'm ready and willing to hold Bethesda accountable. However, what I object to is the attempt to bash F76 itself because of this. When it happens to other developers, nobody tries to claim that's a mark against the developer's games - yet somehow, in this instance, it's considered to be a valid complaint to direct against the game itself. Then again, I never saw why the whole "canvas/nylon" thing was such a big deal anyway. I didn't buy the Power Armor Edition for a bag, I bought it for a replica T-51b helmet, which I have. The carrying bag, map, and army-man-style figurines are just a nice bonus. jeezypete... if you paid $200 just for the canvas bag you are an idiot. > jeezypete... if you paid $200 just for the canvas bag you are an idiot. Buffing everything to stupid high levels and nerfing everything to piss poor levels yields the same results, but not the same community reactions. Also true. I paid $60 for F76, and another $120 for a T-51b power-armor helmet replica with a voice changer (which last bit I didn't even know about until it got here). Given prices for various Halloween costume bits (from many franchises, not just this one), it was reasonable. I also got a carrying bag with a West Tek logo (the company that developed powered armor, among other things), a map, and an assortment of miniatures. Are they in scale with Fallout: Wasteland Warfare? Probably not, because they're not even in scale with each other (then again, if they were either the Mr. Handy would be too easy to lose or the Scorchbeast would fill most of the bag). No need to change the title, there is no bashing in this thread. People merely are stating facts. Are you in the least familiar with the difference between "fact" and "opinion"? Yeah claim you're just stating facts in the same post that contains a video that is %100 pure speculation. Oh no lunchboxes! Bethesda liiiiied!!! everybody panic! Outrage!! Lets take random guesses on what they might contain and make a video with a click baity title about it. 2. They are intending to put lootcrates in the game, in the near future. The code for doing so, is apparently already in place, aka. Todd Howard is a liar. ATX stands for atomic shop transaction, btw. I am basing my opinion on facts. still speculation if you don't know what Bethesda was using the variable names FOR. I didn't say that the lootboxes weren't coming I was just pointing out that any info about the contents inside of them is at this point pure speculation. When did they ever say they would not do lootboxes? My back cannae take it anymore, captain. I mean, you can just choose not to open those. How is it speculation, when it's written into the game already? Sorry, but they said exactly this: It's only going to be -> cosmetic. They recently stealth nerfed the exp gain. This is common practice in the gaming industry (usually mmos), just to sell you the nerfed exp in form of exp boosters and that, along with the other crate contents is far from cosmetic. You can read, right? Stockholm syndrome much? 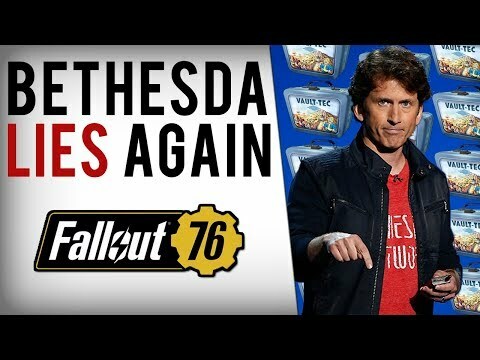 Of course, now that gamers found out about the code being in place, Bethesda is going to pull the brakes on their plans. But still, it doesn't make their secret attempt at shoving MTX into the customers faces, less insulting.